Here's some qualified good news for inflation: October's producer price index rose a less-than-expected 0.4%, but the report also contained some signs of price firming at the wholesale level, which is just what the U.S. Federal Reserve is looking for. October's core PPI rate, which excludes food and energy prices, declined 0.6%, with finished goods excluding food and energy also falling 0.6%. But the latter statistic was skewed lower by a large drop in light-truck and car prices, which sank a seasonally adjusted 4.3% and 3%, respectively. Finished consumer goods prices dipped 0.1%, but most of this was due to an 8.1% plunge in fresh/dry vegetable prices. The U.S. Federal Reserve wants the economy to produce some inflation -- as long as it remains low -- because that would maintain the price support companies need to reap the benefits from increased sales, while not cutting into consumers' purchasing power. To get to that desired outcome, the Fed recently implemented the second stage of its quantitative easing program, or QE2, involving up to $600 billion in additional asset purchases to stimulate economic growth and reduce the risk of deflation, or a sustained drop in prices. A Bloomberg survey had expected both producer prices to rise 0.8% and the core rate to increase 0.1% in October, after 0.4% and 0.1% increases, respectively, in September. Producers prices and the core rate rose 0.4% and 0.1% in August. Although the economy is showing signs of a slight increase in inflation at the producer level, much of it is concentrated in food and energy. During for the past 12 months, wholesale inflation has increased 4.3%. That's up from the 4% year-over-year rate recorded in September. Wholesale prices rose 4.4% in 2009 and 0.9% in 2008. However, take away the often-volatile energy and food component, and much of the inflation in the past 12 months disappears. The core producer prices that the U.S. Federal Reserve monitors have risen 1.5% in the past year. That's lower than the 1.6% year-over-year core rate recorded in September and is at the low end of the Fed's "comfort zone" for inflation. In October, energy prices rose 3.7%, led by an 9.8% surge in gasoline prices and an 8.7% rise in crude oil. 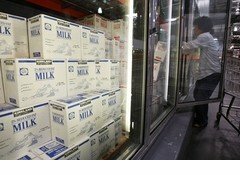 Food and feedstuff prices jumped 4.2%, and intermediate goods prices rose 1.2%. Although October's PPI report represents a partial victory for the Fed, it's far too soon to evaluate the policy because the QE2 strategy has just started. The Fed can point to both the fifth monthly rise in producer prices since March, the increase in year-over-year PPI to 4.3% and the firming in prices for nonvehicle finished goods, excluding food/energy. Conversely, core producer prices are still up just 1.5% in the past 12 months, and that's just about as low as the Fed wants that measure to be. Given the risk of further price declines due to the large contraction in the U.S. workforce and budget-pinched consumers who are watching every dollar, it appears the Fed will have to maintain its latest easing program well into the winter.